Also, there is a way to create and configure a linked server to another SQL Server instance using SQL Server Management Studio (SSMS). To see how to configure a linked server by using the SSMS GUI, see the article How to create and configure a linked server in SQL Server Management Studio. To create a linked server, use the sp_addlinkedserver procedure. In order to get databases from the remote SQL server the exact name of the SQL Server need be entered. When creating a linked server like this by default, it will pass the current security context of the local login to the remote login. @location is the location of the database (source), if required by the OLE DB provider. The @location parameter is nvarchar(4000) data type, by default this parameter is NULL. @catalog is the name of the catalog or the name of the database for the SQL Server, by default this parameter is NULL. When the linked server is defined against an instance of SQL Server, the catalog refers to the default database to which the linked server is mapped. More about sp_addlinkedserver parameters can be found on this link. @useself is used to determine how connection with remote server will be established. There are three states ‘True’, ‘False’, ’Null’. If the ‘True’ state is used, then the current security context of the local login will be passed to the remote login. Note: To successfully connect to a remote server the user with the exact same username and password must exist on the remote server. The @useself parameter is varchar(8) data type, by default this parameter is set to ‘True’. For a linked server that doesn’t require username and password (e.g. Microsoft Access), these arguments can be set to Null. @locallogin is a local login, by default this parameter is set to Null. You can designate either an individual login or all local logins. To specify that all local logins be affected pass a Null to this parameter. If not Null, then in the @locallogin parameter can be a SQL Server login or a Windows login. @rmtuser is the username of the remote login used to connect to a remote server if @useself is set to ‘False’. @rmtpassword is the password of the remote user used to connect to a remote server if @useself is set to ‘False’. @server is the name of the linked server for which to set the option. @optname the name of the option to be configured. @optvalue the value of the option. Valid values are True or On to enable and False or Off to disable the option, a non-negative integer for the connection timeout and query time out options, or collation name for the collation name option. Server ‘WSERVER2012\SQLEXPRESS’ is not configured for DATA ACCESS. More about options under the sp_serveroption procedure can be found on this link. To see information about linked servers and the referenced data sources, SQL Server Management Studio or the system stored procedures can be used. Below is the list of the most commonly used system stored procedures. To see all about login mappings defined against a specific linked server, run the sp_helplinkedsrvlogin procedure. Linked Server is the name of the linked server. Local Login displays which local users are affected by this mapping. If Null is set, this mapping applies to all users who don’t have specific mappings. Is Self Mapping, if it displays 1, the local login and password are used when connecting to a linked server. If 0 displayed, then the value from the Remote Login column are used for connecting to a linked server. Note, remote password is not displayed for security reason. sp_table_privileges_ex – displays table permissions for a linked server table. If the test fails, it returns an error message with the reason of the failure. OLE DB provider “SQLNCLI11” for linked server “WSERVER2012” returned message “Login timeout expired”. 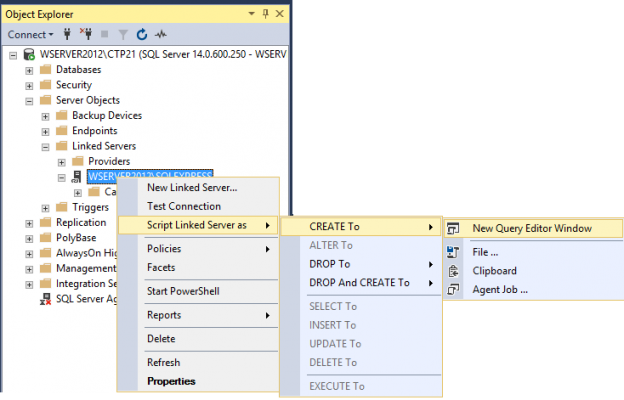 OLE DB provider “SQLNCLI11” for linked server “WSERVER2012” returned message “A network-related or instance-specific error has occurred while establishing a connection to SQL Server. Server is not found or not accessible. Check if instance name is correct and if SQL Server is configured to allow remote connections. For more information see SQL Server Books Online.”. On the top right side of the dialog, there are three tabs (General, Security, Server Options) on which can be seen all settings for the chosen a linked server. To delete an existing mapping between a local login and login on a linked server use the sp_droplinkedsrvlogin system stored procedure. The server ‘WSERVER2012’ does not exist. Use sp_helpserver to show available servers. ‘Jana’ is not a valid login or you do not have permission. If the @locallogin property is set to Null, the default mapping which is created when a linked server is created by sp_addlinkedserver procedure will be removed. @server is the name of the server that will be removed. @droplogins if the ‘droplogins’ value is set, then all logins for the specified remote server will be removed, by default the @droplogins property is set to Null. There are still remote logins or linked logins for the server ‘WSERVER2012\SQLEXPRESS’.